One of our final rehearsals in the room before heading off to the contest stage. It was crazy. It was a weekend. And it was also our very first barbershop contest! We walked out with the first place medals, which is amazing, but we also walked out so much closer to our Area 2 sisters, more educated thanks to the judges and the incredible performers who call Area 2 home, and more deeply bonded as a quartet than we could have ever imagined at the start of this amazing journey! Coach Richard Lewellen kept us calm and focused... we couldn't have done it without him! 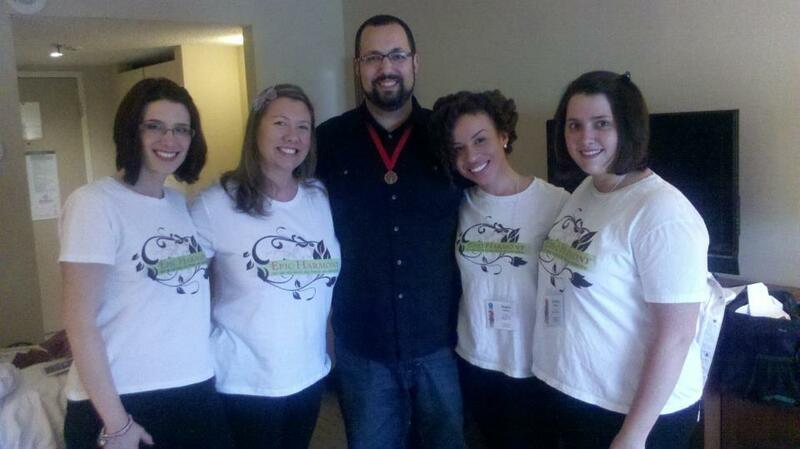 We are so incredibly grateful that our coach, Richard, was in Montreal with us. He kept us focused and on time–which is defintely saying something for Epic. We know that we have a lot to learn and more growth to accomplish, but Richard helped us take onto the contest stage the skills and knowledge we have at this point in our development. We love our Ricky… our moments on the contest stage couldn’t have happened without his love, expertise, and spankings (just kidding). We are completely in love with the judges/candidates who conducted our evals… John, Chris (music), Claire, Lynn (singing), and Linda and Kerri (presentation). We love you. We trust you. We will work on everything you shared. We won’t let you down. And, ohmygoodness, Area 2!!!! These women are AMAZING. The Montreal City Voices chorus not only hosted the entire weekend event, but also took to the contest stage a super-fun package! We are so excited that Sounds of the Seacoast took the top honors… and we have to say that those Saturday night coconuts in the front row were getting us all hot and bothered 🙂 !! New England Voices of Harmony (2nd place) wowed us with its “Shall We Dance” tune and the Women of Note chorus had such a great presence on stage (and they have the presentation scores to prove it!). 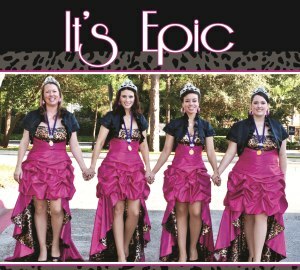 The Capital Chordettes of Ottawa have a special place in Epic’s heart. We performed for them in Hershey last year and they welcomed us back with such warm arms to their hospitality room in Montreal… a big congrats to them on their 4th place finish. At the end of the day, Area 2 is sending TEN choruses to International in Orlando. We thoroughly enjoyed the entire chorus contest!!! Since we performed first in the quartet contest, we were able to watch many of the performers who came after us. So much talent crossed the stage that night. A huge shout-out to Moonstruck…. these ladies, who placed second, had us all sitting on the very edge of our chairs. Their package was stunning and we loved “Mean to Me”… a breathtaking performance. We are very excited to be heading to IC&C in Orlando with not only Moonstruck, but also Songburst, Stay Tuned, Kismet and In Cahoots! The Saturday night luau-themed dinner was so fun… from judges doing a hula to Linda’s emcee performance to Lindsay C-H shouting out, “Ma!!! Your napkin is still in your pants!” when her mother walked up on stage to make a presentation. OMG, we laughed for a year… We also had a slight love affair with the food. BEST EVER. The staff at the Laval Sheraton was amazing…they put our food under the warmers so we could eat it after our performance. It really made our night. We love our "Andrews Sisters" fascinators! Thank you Debbie! 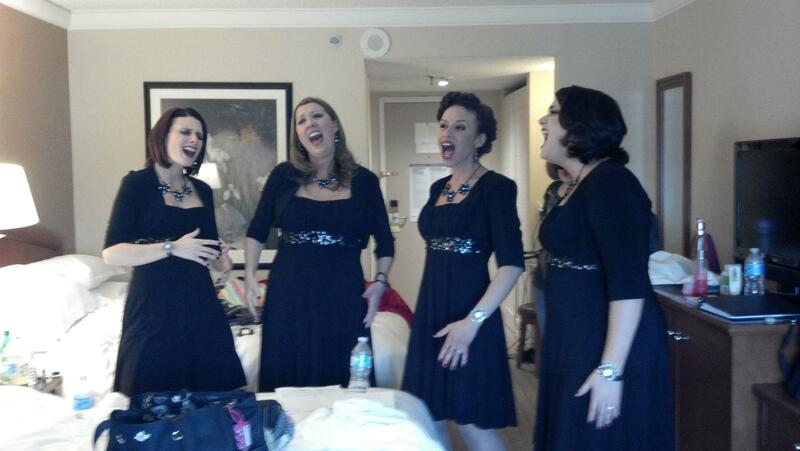 We were surrounded by loved ones… Dawn, Keith, Epic mom Debbie and Epic aunt Cindy. Thank you for sharing our amazing weekend with us. Thanks for the support and the gifts and the cheers and the hugs and the laughs. And thank you, Debbie, for the FASCINATORS. We love you all to pieces. Anne scared away a non-barbershopper hotel patron with her bodily functions. Kris tripped on her heels, fell to the floor, and showed an entire chorus her undergarments. Shana’s food-dar found us a restaurant that we visited pretty much every time we ate. Thanks to Shana’s eloquent words, we invited God to be a part of our performance in our final moments in the warm-up room. It worked. We are crazy enough to be developing a preference for certain brands of fake eyelashes. We love Foreign Exchange. Classy chicks. Super talented. We have developed as a quartet a few new harmless man crushes… they include John Burri, a rude-but-hot server at an Italian restaurant and Shana’s dad. Chris introduced us to the “On a scale of 1 to 10” game… a phrase that can be followed with anything. Ex: On a scale of one to ten, I’m blowing the wrong pitch. On a scale of one to ten, we don’t have enough towels. Ok, ok… enough…. we know! We are just so full of love coming out of this past weekend. We had SO MANY Area 2 Harmony sisters thank us for being a part of the organization and for representing them at Orlando and as Area 2 champs. Please know that the pleasure is all ours. We are humbled and so incredibly grateful for the opportunity. We love you all to pieces…. Can’t wait to reunite once again for more contest craziness. Coach Richard Lewellen kept us calm and focused… we couldn’t have done it without him! 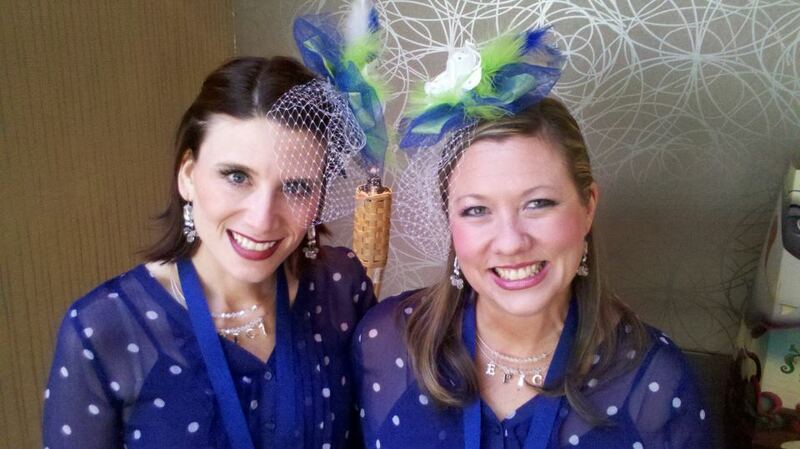 We love our “Andrews Sisters” fascinators! Thank you Debbie! Dear Epic – what a wonderful winning performance! And it was great getting to know you and your “story” a little better. You are a bunch of crazy gals (in a good way) and you’re going to fit right in with the rest of us crazies in Area 2. It’s tough to be on the outskirts of the Area, but we’ll do our best to keep you in the fold. Can’t wait to see you again in Orlando! It’s easy to see that when a quartet competes for the first time at area competition, and comes in FIRST, they have something special! And I know that when you invite God to be a part of anything He will bless it 10-fold. It was clearly evident by your performance on stage Friday night that it was a ‘first-place” performance. Congratulations!!! You ladies rock! I am proud to be represented by such grace and talent at International in November and I will be there cheering for you on stage!